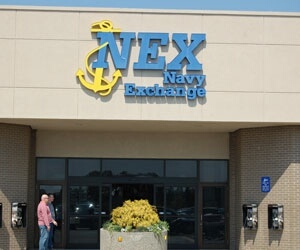 A Wednesday ribbon-cutting at Navy Exchange Norfolk will mark the grand opening of its newly expanded Main Store. With more than 180,00o square feet of retail space, it is now the largest Navy Exchange in the world. Fitting, since NOB is the world’s largest naval base. The June 29 grand opening will feature visits from a couple of pro sports celebrities: fearsome Baltimore Ravens linebacker Ray Lewis, and fearsome Ultimate Fighting Championship fighter Phil Davis. The addition to the expanded Main Store opened in July 2010 and features a larger selection of toys, sporting goods and grocery items, according to the Navy, and what is being billed as a “state-of-the-art” lawn and garden center. The addition’s second floor has an expanded uniform/tailor shop, a major appliance center, a large selection of mattresses and an enhanced special order center. Meanwhile, the original exchange has been fully renovated and features expanded fashion departments and upgrades such as improved cash registers. The Navy Exchange Mall is home to renovated barber and beauty shops — with “spa” services! — upgraded optical and dry cleaning shops, a sunglasses/watch shop and a renovated food court. The $25 million project took three years to complete, the Navy says.